Tripping over cleats can be very dangerous. With Accon Marine’s Folding Cleats, boaters can easily enhance safety aboard while adding sleek hardware. Simple to use, the Folding Cleats lock down and out of the way when not needed. Then, with the push of their release button, they spring back up ready for action. Constructed of highly durable 316 stainless steel, Accon’s Folding Cleats are offered in two versions: stud mount with hidden fasteners or through-bolted with visible screw holes. Stud length is 3.81 cm. Since they mount on the surface of a boat, no cut-outs or hole saws are required. These Folding Cleats won’t leak into the boat, so drain tubes and receptacles are unnecessary. So-Pac has all sizes in stock (115mm-253mm) as well as a thru-bolted option. Edson 2013 Catalogues out now! Edson’s latest catalogs include Sailboat Steering Systems, Premium Boating Accessories, Electronics Mounts, Powerboat Products, Distinctive Yacht Wheels and Traditional Steering Gear – all full of the highest quality boating products you’ve come to expect from Edson. Click here to visit the Edson site and browse the catalogs. Shoot us an email or give us a call on + 64 9 448 5900 if you have any questions. PYI Floor Anchors are designed and engineered to secure floorboards or lock hinged panels. Made out of 316L stainless steel, they will not corrode, discolor with age or dama ge the wood surface. The Floor Anchor safely holds 500 lbs per unit. The PYI Floor Anchors meet ISAF (formerly ORL) requirements for offshore boats (category 2.03). designed for extended on-board stays. Francesco Nannetti of Azimut visited the WESMAR plant in December to present WESMAR with its initial order for 12 WESMAR Model DSP4801 digital stabilizers. This sale to Azimut is interesting as Azimut is a major shareholder in “Seakeeper” Gyro systems, and we understand the Magellano 50 is equipped with Seakeeper Gyro. 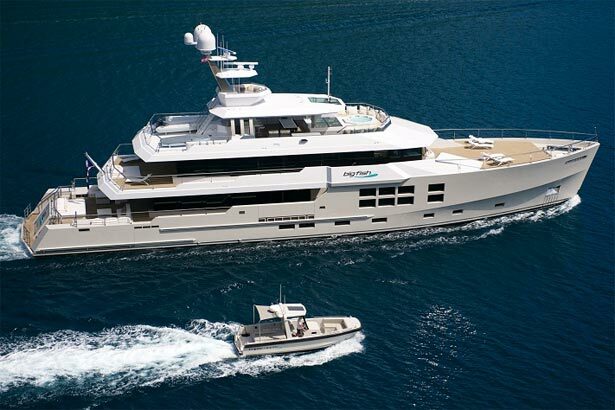 The perception is that on this size of motor yacht, gyro’s may be the more suited stabilizer for “at anchor/zero speed”, but active fins are preferred for passage making. Please contact Max Hall if you have any further enquiries. January 4, 2012 – Freeman Marine Equipment Inc., a globally recognized brand and major US supplier to the worldwide marine industry, is now part of Advanced Marine Technologies (AMT). The company was purchased by AdvanTec Global Innovations of British Columbia, Canada. AdvanTec owns the four companies that make up the AMT Group. The other members of the group are Diamond Sea Glaze, Steelhead Marine and Manly Marine. Freeman brings thirty-six years of innovative design, manufacturing experience, project management and customer support to the enlarged AMT family of leading brands for yacht, commercial, ferry, military, patrol & rescue vessel needs. Located in Gold Beach, Oregon, USA, the company has 85 employees, including a specialized team of engineers and designers. The company will continue to operate from its present location with no changes to management planned. Freeman Marine is an ISO 9001:2008 registered company following lean manufacturing practises. “We are very excited and looking forward to the addition of Freeman Marine to the AMT Group”, says Dave Bockhold, CEO of the marine group. “Freeman is an excellent fit with our existing product range and will bring new capabilities and expertise to AMT’s speciality of designing and manufacturing quality components for the marine industry. There is very little overlap in terms of product redundancy and competition between the companies. Bo Shindler, Freeman’s General Manager, adds “Freeman is proud to be a respected force in the marine closure products industry and we are looking forward to developing new areas of growth. Together with the other members of the AMT Group we can collaborate to share process efficiencies so that we are able to offer builders an even broader line of premium doors, hatches, windows, cranes and specialty products. Freeman Marine, Diamond Sea Glaze, Steelhead Marine and Manly Marine operate from their own locations; however, product sales will be managed at a group level. For more information please visit www.AdvancedMarineTechnologies.com . Holland Marine Parts Water Jet Thrusters have entered the market with an innovative approach to manoeuvring that eliminates many problems normally faced with installation of traditional thruster systems. So-Pac Marine Ltd reports the first sale in New Zealand of Wesmar’s Digital Zero Speed active stabilization system. These systems use an advanced high-powered digital processor and dynamic triple axis gyro that provides real time vessel roll and fin movement on the wheelhouse display. Experienced overseas owners claim 90% roll elimination underway and 70% at anchor. Because active fins become effective immediately when engaged passenger and crew ‘mal de mere’ is minimal. Wesmar manufactures active stabilizer systems for power boats between 10 meters to 80 meter superyachts and commercial vessels with fin sizes from 2-1/2 to 50 square feet. Zero speed operation requires AC power from the genset and usually suited to boats over 20 meters. Wesmar designed the world’s first electronic stabilizer in 1986 and has over 4 0 years history in commercial-grade marine equipment including bow thrusters up to 400 kW. The attached Zero Speed Report details the experience of the very happy owner of Blue Dragon, a Sunseeker Predator. Cerion Energy’s GO2 diesel fuel additive, which is being exhibited at this year’s METS has been nominated for the highly prestigious DAME Design Award 2011. GO2 has already attracted the interest of the judging panel for this year’s prestigious DAME Design Award and has been nominated for an award from among a total of 133 entries from 21 countries. GO2 is a cutting-edge nanoparticle-based diesel combustion additive that provides a significant improvement in fuel efficiency while reducing emissions outputs for all types, sizes and ages of marine diesel engines. GO2 enables owners to dramatically reduce the impact of their yacht’s engines on the environment, whilst achieving significant financial savings from increased fuel economy and improved enjoyment due to reduced visible soot and exhaust smells. GO2 was recently trialled on a 62 metre motor yacht and the independently verified results show a 14% reduction in fuel consumption combined with a 69% reduction in unburned fuel (diesel odour) and a 35% reduction in soot (carbon particulate matter), together with significant reductions in CO2, CO and NOx. View Cerion Energy’s GO2 Diesel Fuel Additive in the Superyacht Pavilion at METS this year on stand 10.421.